• The sacramental preparation of children is the responsibility of the home, school and parish, working together in partnership. 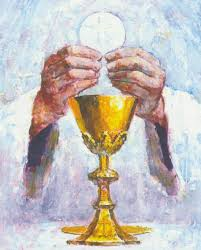 • The work of sacramental preparation begins long before the First Eucharist celebration. • The celebration of First Eucharist is a sacred and important moment on a long journey of faith development. together with Baptism and Confirmation it opens the door to full membership of the Christian community. it is not an end in itself. • The sacramental preparation of our children must always be seen as one element of the broader task of whole-community catechesis.